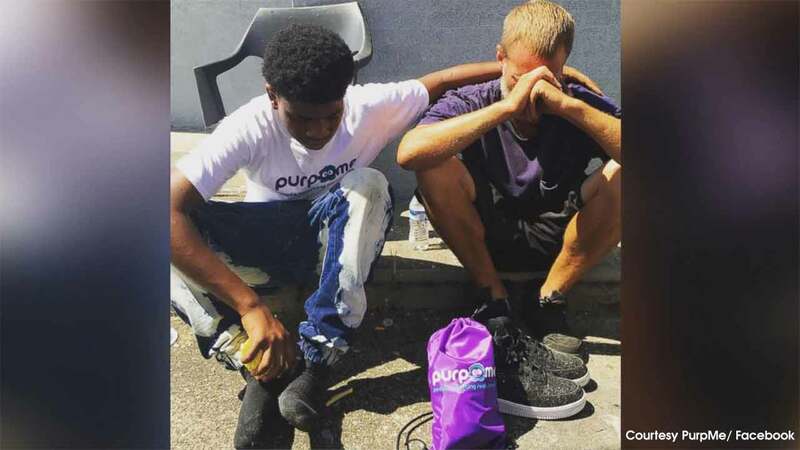 LOUISVILLE, KY -- A kind act by a 14-year-old from Louisville, Kentucky, has touched the hearts of thousands of people on social media after a photograph of him giving away his shoes to a homeless man has gone viral. The act of kindness took place on Labor Day when Laron Tunstill Jr. (a.k.a. Ron Ron), went out to do homeless outreach with fellow members of PurpMe, a local nonprofit group. "Ron Ron and I went out with bean soup and corn bread and just went out to spread love in our neighborhood," said PurpMe founder Jason Reynolds. "We saw a homeless man who had holes in his shoes, and, without hesitation, Ron Ron took the shoes off his feet and gave it away," Reynolds told ABC News. "They sat and talked to each other. The homeless man explained that he had gone through a lot of loss and hurt in his life, and Ron Ron was very moved by his story." Like the homeless man, the teen is no stranger to struggle. Reynolds explains, "Ron Ron was a wild kid. He grew up in a rough area where people get shot all the time. The streets affected him a little, and at one point, he was fighting more, being disrespectful." Reynolds said he reached out to Ron Ron and served as his mentor. Reynolds says through that mentorship, and what he believes is "God's grace," Ron Ron underwent "a change of heart." "Now, he's the one mentoring other kids," Reynolds said. "It's amazing. He's just so passionate to make a change in the world and inspire other people." Ron Ron's photographed act of kindness has since gone viral, garnering thousands of reactions and shares on Facebook in less than a week.